It’s just over a week until our Kickstarter campaign launches, and the excitement at Soothsayer is mounting. Most of the necessary work is already complete, but there are still a few campaign materials that need finalising… not to mention a very long list of PR and administrative tasks to be done. Overall, though, the mood is positive and optimistic, and we can’t wait to get going. 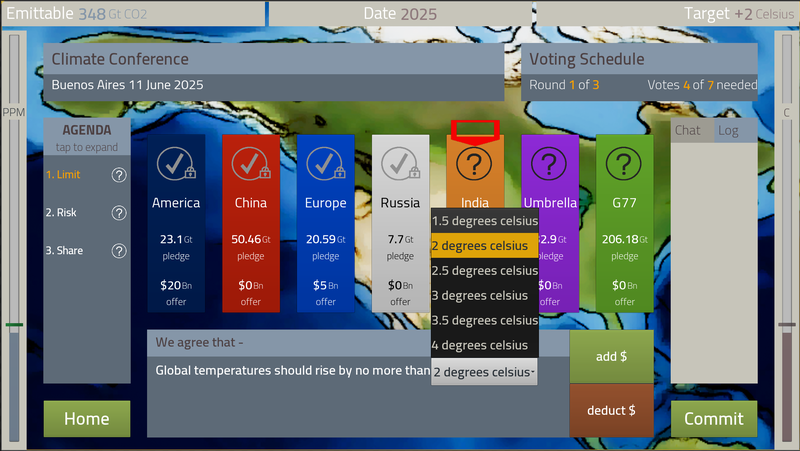 In the meantime, we thought we’d take a quick break to share with you something rather special: the first view of our Climate Conference mini-game, which is the main new game feature we’re adding to FOTWO. As with our previous reveals, we stress that we’re showing you the first-pass working version; many improvements are planned once the Kickstarter has finished. This is the worst it will ever look. But, with that said: behold the Conference Screen! There’s quite a lot of different things going on here, so we’ll break it down piece-by-piece for you. First of all, you’ll notice that the screen-bordering Arch element we talked about last week is still very much present. It’s designed to be a constant reminder to you of Earth’s atmospheric situation, and what you’ve pledged to do about it. Beneath that is the current conference name, and where it is located. For now, all the conferences represent the UNFCCC Conference of Parties, but we’re also exploring using this mechanic to handle other types of diplomatic function as well. Each conference has a specific location and date; in the current game cycle, these occur every five years (i.e. once every five game turns). 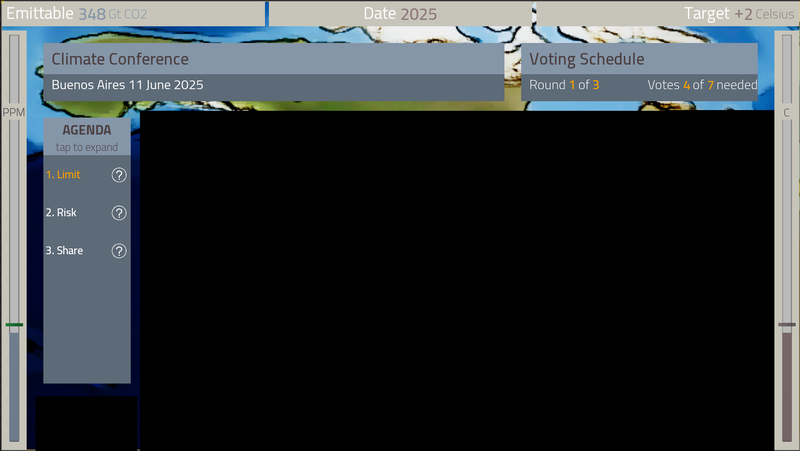 Each conference has a set number of agenda points to discuss: players can vote on the issues they want raised as a side-task in the normal game turn. 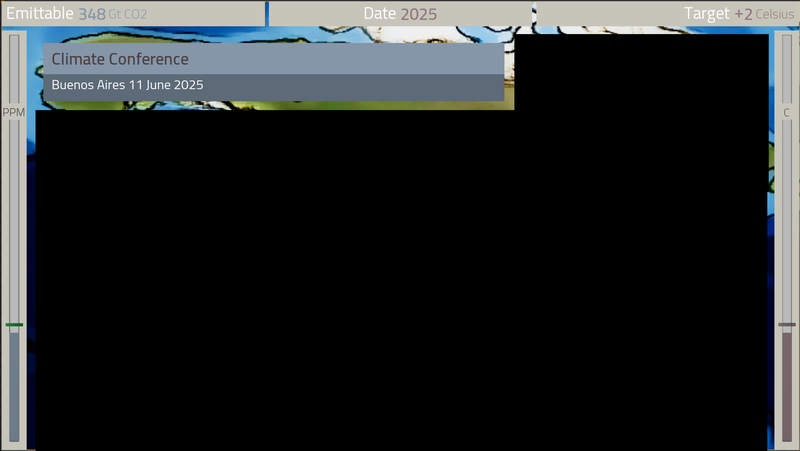 These agenda points are listed in the bar on the left-hand side of the screen. Each agenda point must be discussed and voted on by the conference attendees within a set number of rounds. For a motion to pass, a quorum of votes must be achieved – usually, unanimous consent is required. Attendees discuss the motion using what we call the “argument panel”, which lives at the bottom of the screen. It represents the current wording of the motion, and can have one or more clauses which can be amended by attendees. In the example below, we see that the motion is to agree a maximum global temperature raise, much like that agreed in Paris in 2015. Clearly, though, this is not to the liking of the active player, and they are considering changing it. Going down to 1.5 degrees would be an ambitious target, but one which requires much more stringent emissions limits… is this a motion that the group could accept? Or would they rather risk the health of the atmosphere over that of their economy? Maybe your fellow leaders might be persuaded if you were to put some cash on the table. The “add” and “deduct” buttons allow you to offer aid to other attendees. They can also be used to request a donation, if you find other players’ proposals rather unenticing. Every time the terms of the deal are changed, all participants gets to vote on the new wording. 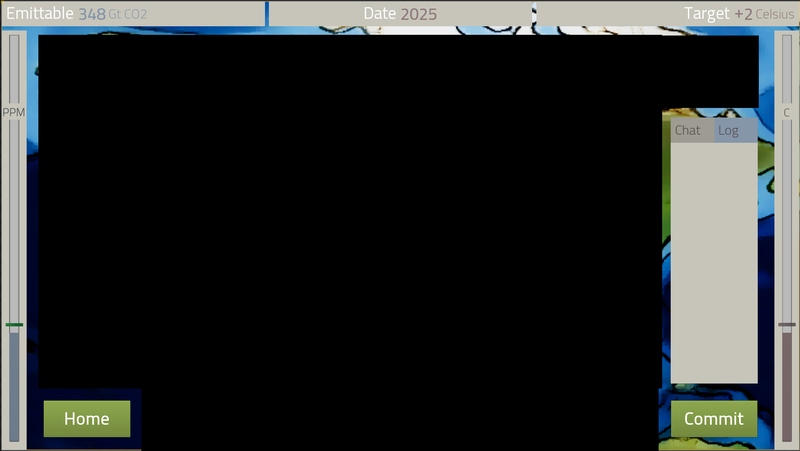 The active player is indicated by a red marker (seen above in an early state: it’s intended to have a timer incorporated, showing how long you have before you automatically pass the round to the next player). As you see, we currently plan on 7 attendees. Of these, the first five from left to right are intended to be the “Player” characters , while the Umbrella group and the G-77 are voting blocs that together account for all the other countries in the world. The remaining elements are the basic game controls: the Commit button transmits your proposal to the rest of the table, while the Home button allows you to visit your domestic interface if you need to check up on any information. Finally, there is the chat/log window, which records a full event history of the proceedings, as well as being the place you can text chat with other players. Overall, our goal was to build a tool that could handle multiple-party diplomacy in a way that permitted complex negotiations, but was also swift to resolve. So far, we’re pretty pleased with how it’s worked out. With that all said, it’s time for us to get back to our Kickstarter duties, to make sure as many people as possible know it’s happening. 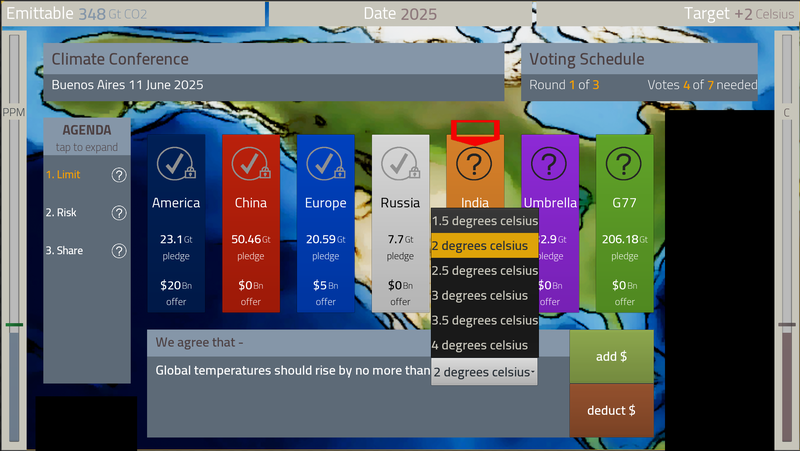 Similarly, if there’s anyone you know who you think might be interested in what we’re doing, please do let them know what our plans are: to create a game that’s the most effective and enjoyable way to understand climate change. 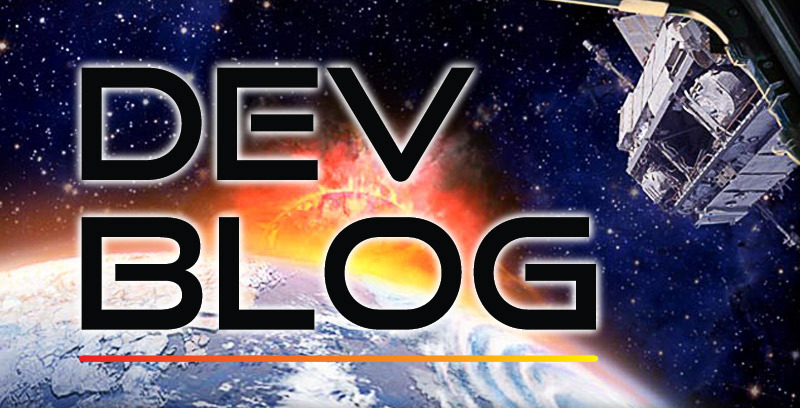 We’ll be back with another dev blog later on in the week, where we’ll be showing you some of the work we’ve been doing on the Event screen. In the meantime, you can always find us on Twitter at @fateoftheworld, or join the discussion in our FOTW Online Facebook Group. Oh, and remember: newsletter subscribers always get the reveals first, so be sure to sign up if you haven’t already – just use the widget on the right of this screen.